Since my colleague Andrzej had heard I was doing karate, every now and then he would “Osu” me in the Kyokushinkai fashion. That was always perfectly ok with me, I actually thought it was funny. All has been said about what Osu means, how it evolved etymologically, where it is used and where not. I also have a somewhat decided opinion about “Osu”, and it has historical reasons. So here’s my take on “To Osu, or not to Osu”. The “Society of Martial Virtue of Greater-Japan” (Dai Nippon Butokukai) was established in 1895. It was the year of Japan’s victory against China, ending millennia of cultural and military hegemony of the “Middle Kingdom”. The purpose of the Butokukai was to promote the Japanese bujutsu and to galvanize them with the “martial spirit” of Emperor Kammu (reigned 781 – 806) into an ideology of a Japanese spirit (wakon 和魂), later propagandized by Japanese nationalists as “the brave, daring, and indomitable spirit of Japanese people” and as one of the key doctrines of Japanese militarism. The construction of the Hall of Martial Virtue (Butokuden) was completed in 1899 close to the Heian Shrine in Kyōto and branches of the Butokukai were established throughout the country. Every year in May the Butokukai held its Festival of Martial Virtue (Butokusai), which was were Okinawa karate first appeared in Japan. Main gate of the “Dai Nippon Budo Senmon Gakko”. 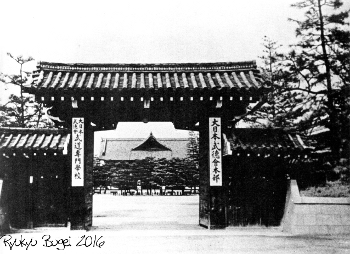 In 1905 the Butokukai opened a private training institute in Sakyō, a district of Kyōto. It became known as the Dai Nippon Butokukai Budō Senmon Gakkō, or the “Specialized School for Budō of the Society of Martial Virtue of Greater-Japan”. Built and managed by the Butokukai, the school served the training of bujutsu-instructors – mainly kendō and jūdō – who were active in regular school education. The purpose of this institution was the same as that of the Butokukai, ie the practice of bujutsu and the cultivation of a samurai spirit. A main focus in the education of the bujutsu-instructors for higher school education was the study of the Japanese language and of classical Chinese texts. 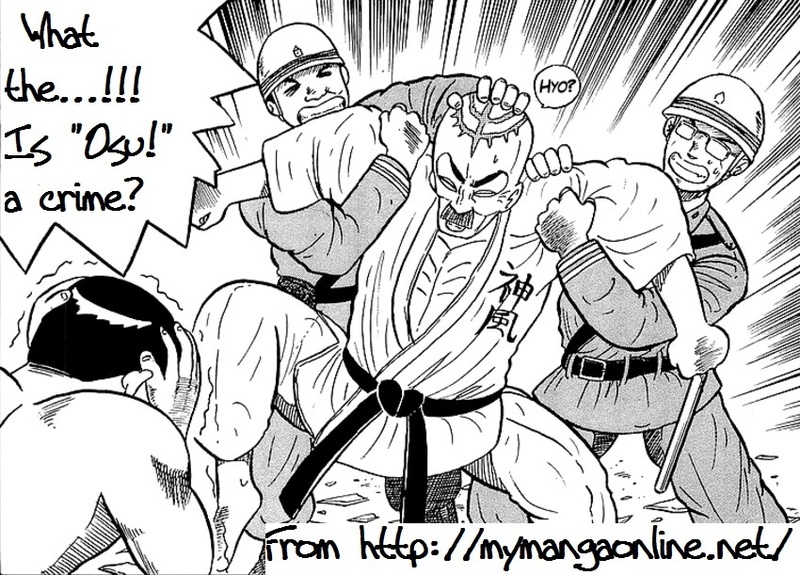 This was deemed necessary to ensure that the students who practiced the bujutsu were also able to theoretically study and understand them. The Senmon Gakkō was considered as one of the best institutes for the training of martial arts instructors in the country. Admission was granted without exception to the male gender only. A minimum necessary rank in budō had to be achieved, too. In the event of failure to achieve this rank the university degree was denied. In kendō the students in the first grade were only allowed to practice kirikaeshi (diagonal strikes to the head alternating from the left to right). In the second grade they were only allowed kiri-kaeshi and kakarigeiko (fierce repetition of techniques in the chord). Jigeiko (free fight, without scoring) was allowed only in the third and fourth grade. Strong basics and spirit was emphasized. Techniques included even grappling and brawls and other techniques unknown to modern kendō. Training was ferocious, including fatalities. Once a month an “Evaluation Meeting” took place, hosted by the students of the fourth grade. The third and lower grades had to listen to their “sermons” and exhortations for around two hours while kneeling in seiza. In case of failures in everyday life or elsewhere, such as failing to show courtesy or satisfactory submissiveness, they were physically chastised. A pronounced sempai–kohai-relationship with its hierarchical pecking order was a serious matter in this school’s tradition. Graduates of the school received a state license as middle school teachers without having to have completed a proper teacher training course or the accompanying examination. From the 1920s to the 1930s budō witnessed a rapid growth, however, just as a bone in the skeleton of Japanese militarism. While militarism, colonialism, and imperialism were clearly visible already for decades, war escalated from the Manschurian Incident (1931) into the 2nd Sino-Japanese War (1937-1945) and the Pacific War (1941-1945) as part of World War II. Budō as well as the Butokukai as the most prestigious and influential institution became closely associated with ultranationalism and “Emperordom”. Japanese martial arts grew during this time primarily because they were a cog in the ideological machine of national mobilization. With the defeat of Japan in 1945, the General Command of the Supreme Commander of the Allied Forces dissolved the Dai Nippon Butokukai and banned the teaching of budō in schools and universities. The Senmon Gakkō was renamed to “Kyōto Specialized School – Department of Humanities and Literature” (!!! ), but closed its gates after the last graduation ceremony in January 1947. It was the Senmon Gakkō where the salutation “osu!” was born. It is the gross residue of an obsolete male language, bordering to the obscene, and the expression of an ideological budō closely related to ultranationalism, militarism, and imperial megalomania. To “Osu”, or not to “Osu”: for me it is not a question. This entry was posted in Misc and tagged Budo Senmon Gakko, Dai Nippon Butokukai, oshi shinobu, Oss, Osu. Bookmark the permalink.